I recently claimed that I was never grumpy, which someone challenged, telling me that my attitude towards those who mistook Battersea for Clapham was textbook grumpiness. I corrected them. My attitude towards those who make such simple geographical mistakes is best described as righteous anger. It is currently aimed towards Travelodge, who are currently completing a new hotel on Falcon Road. Being a building site they have caused problems for their neighbours on Mossbury Road to be sure, but through it all I remained fairly emotionally balanced. But when their new hotel was listed on their website it immediately provoked a fit of righteous wrath. To be fair, they did make attempts to compensate, cutting through decades of TfL delays and engineering to put Clapham Junction on the London Underground network (with an entrance I assume is in the menswear at Arding and Hobbs Debenhams). Despite that, I decided the only proportionate response was an email to the chain. Apart from being wrong about being ‘between Clapham and Battersea’ (because they are in Battersea), I can see the logic. 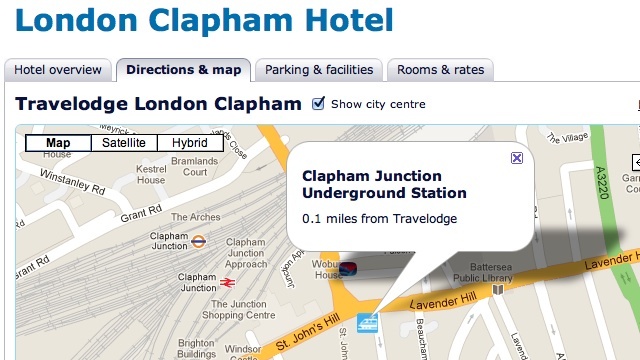 And it does leave open all sorts of alternative names; I was wondering about Manhattan Travelodge, it is, after all, located between Manhattan and Southend-on-Sea, but they already have a Southend Travelodge. Sadly, I think this translates to ‘we’ll pass this on to someone else to ignore’. On the upside, the responses at least mean we have an email address for Travelodge which obviates the need for their awful customer service webform, it’s customer.services@Travelodge.co.uk. In fact, I’ve gone even further. If you think they need to re-think, then here’s a pre-filled email with a few facts that might help convince them to reconsider their name.